I know a lot of you have been waiting for this quilt-as-you-go tutorial, so here you go! You can find a video tutorial below which I had the privilege of filming at The Fat Quarter Shop with Kimberly and their wonderful team. The quilt in this video tutorial is from the “Solstice Quilt” pattern from my first book, Quilt As-You-Go Made Modern. 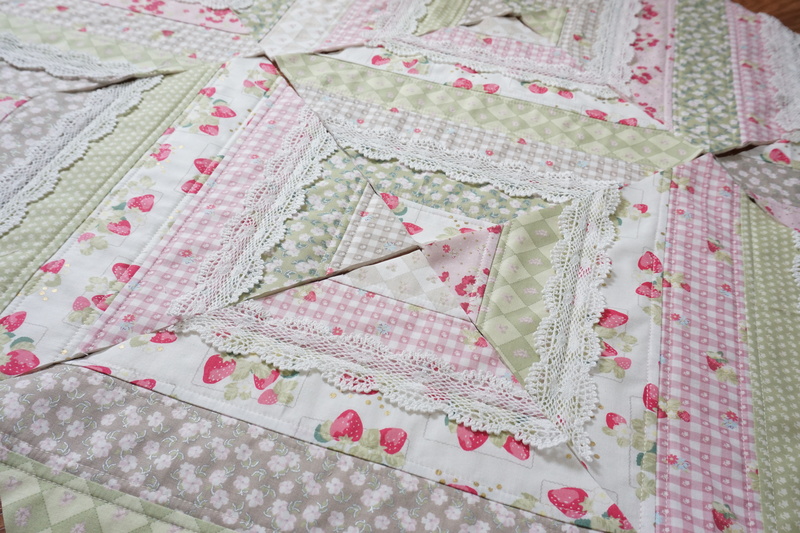 The main difference (other than the fabric) is in this video I show you how to add lace embellishments to the quilt. 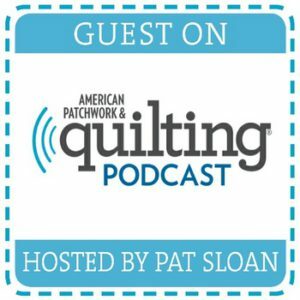 My first book has two quilt as-you-go joining techniques, and in this free video tutorial I explain how to use 1 of the 2 techniques. 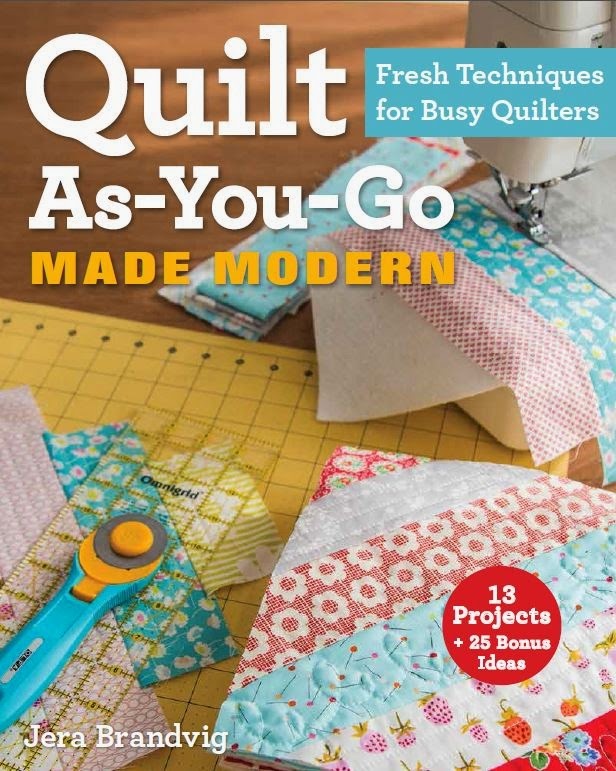 My second book, Quilt As-You-Go Made Vintage, which comes out later this month (September 2017) has a 3rd and all new joining technique which renders a reversible quilt! You can read more about that in THIS post. 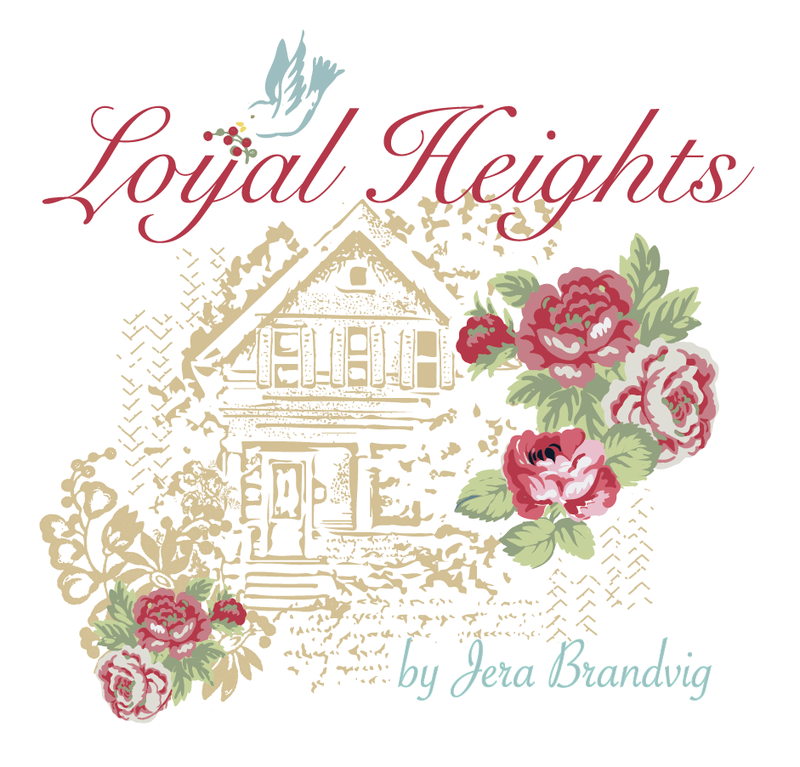 My 2nd book, which comes out later this month! 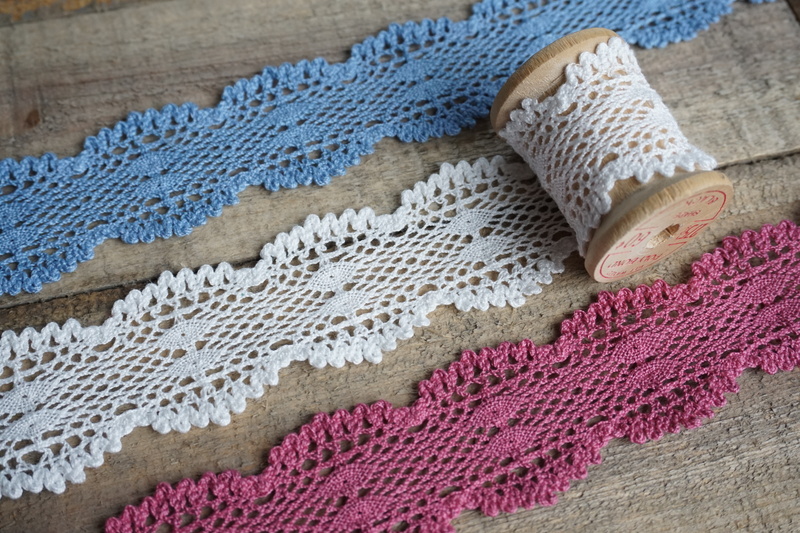 The lace I used in my video tutorial are from my La Conner lace collection for Lecien fabrics, which can be found at The Fat Quarter Shop, along with all my fabrics and thread. Click here to see it all! 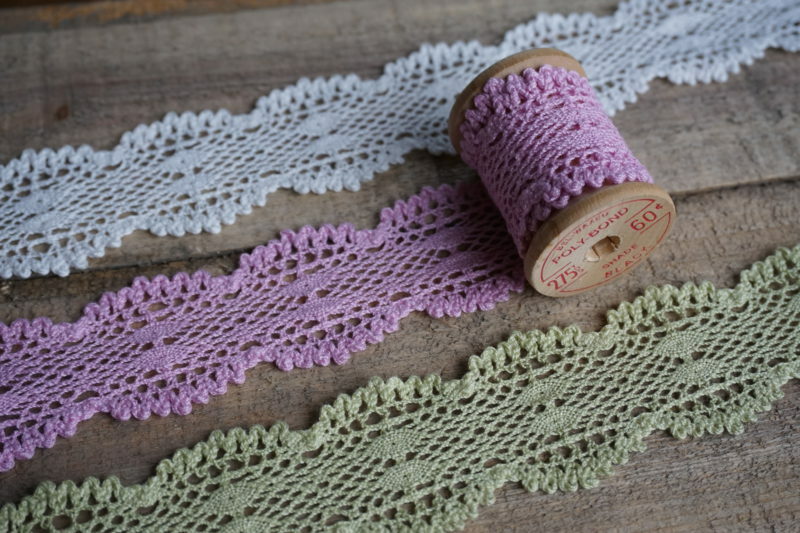 La Conner lace comes in 5 different colors, including: vanilla, peony, sage, blueberry and cranberry. For this tutorial I used vanilla lace. And of course the fabrics are from my 2nd fabric collection for Lecien, called La Conner. All right, here is the free video tutorial! I was way too nervous during this filming as it was my first tutorial I did while I was on site. However, everything you need to know to make this quilt came across clearly, which is all that matters! x-) I was a lot less nervous by the time I filmed my La Conner tote bag tutorial . 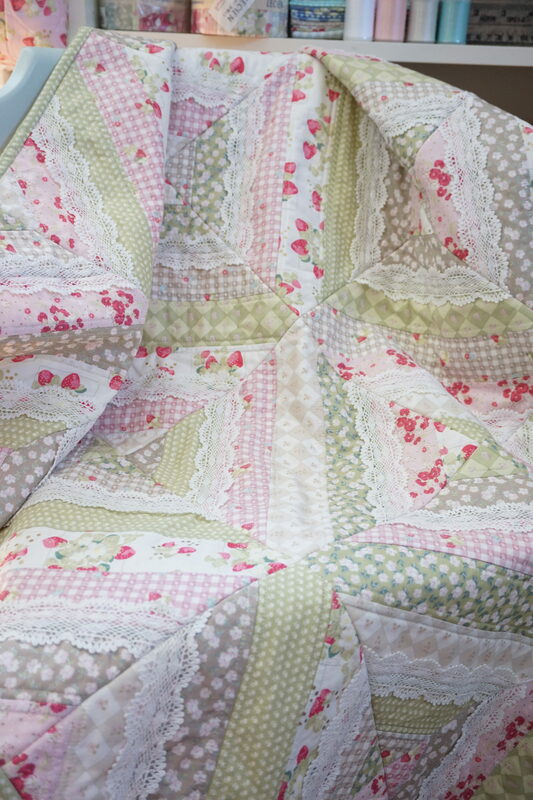 With that, i’ll leave you with a couple more photos of this beautiful quilt! 🙂 The lace really adds so much charm! 23 Responses to Quilt-As-You-Go Made Modern – Strip Quilt with Lace tutorial! Hi Jera, this is the most beautiful quilt. Such a delicate look, I love it. I’ve always wanted to try a QAYG so will be looking further into your video. Love it. Thanks for sharing. I loved each and every one of your videos. You did wonderfully!! 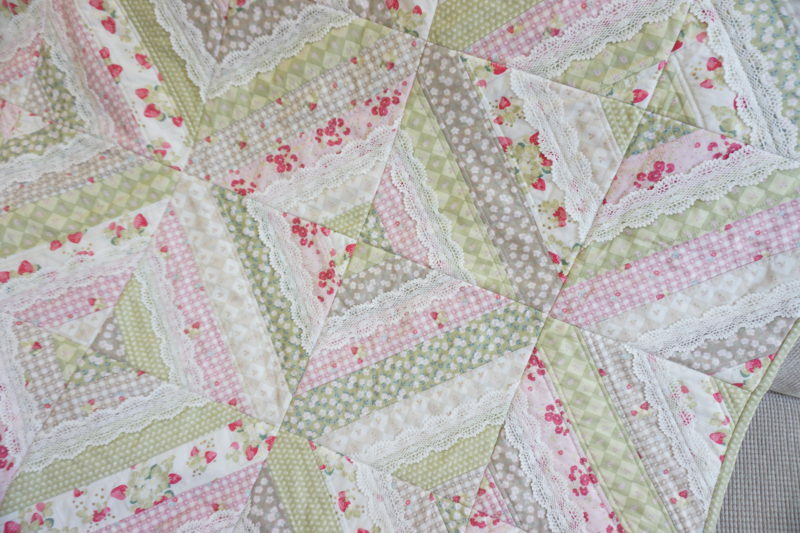 Love the quilt as you go technique – tried it long ago, before knowing if it was even possible – just didn’t know how to attach the blocks properly at the end. Thank you for doing these videos with Fat Quarter Shop! Love the tutorial. I am going to make a QAYG. Thank you for your effort and hard work to make this possible. This appeals to me so much, I think I may just start on it when I have a few minutes to look at your tutorial. I didn’t realize I already have this pattern in your first book 🙂 I love the lace embellishments. Oh I do adore your comments 🙂 You are always so thoughtful and encouraging 🙂 Thank you! This is such a beautiful quilt!! Thank you for the video. You are very welcome! Hope you enjoy the technique – it’s quite fun and refreshing! 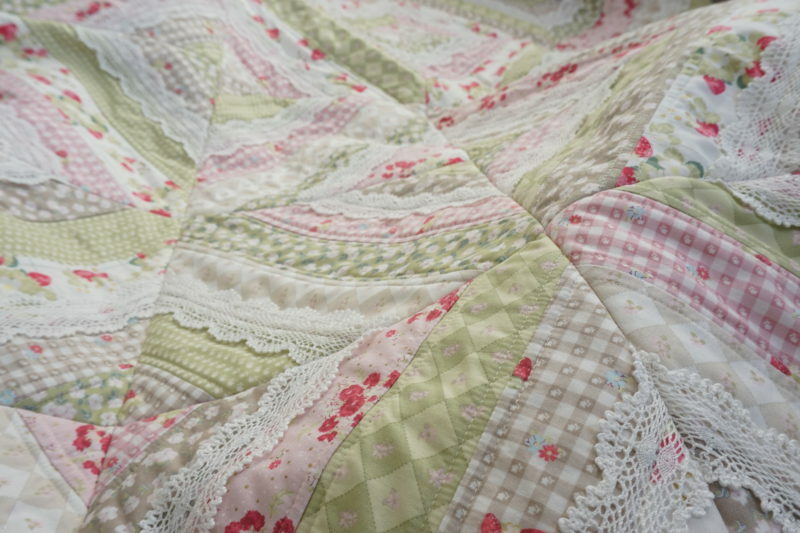 This is a gorgeous quilt and thank you for the video tutorial. I have your first book and I am anxiously waiting for your new book. Congratulations! Thank you for your kind words! Also, a huge thanks for supporting my books, it means a lot! Oh Jera! You are just the cutest ever! I have made 4 quilts from your book (which is personally signed by you 🙂 and I just love this QAYG method Thanks for the video as I just love video tutorials! I cannot wait to,receive your second book as I have already preordered it! Thanks for all you do to inspire us! I loved,just loved your video with the QAYG and that lace! My book will be delivered Sept 12 my tracking says. Where can I get the 9 fat quarters shown in the video? I am only finding huge bundles, and not many shops sell individual fat quarters any longer. Would the !/4 traditional cut work? I dear;y love the new La Conner fabric! You are a breath of fresh air! 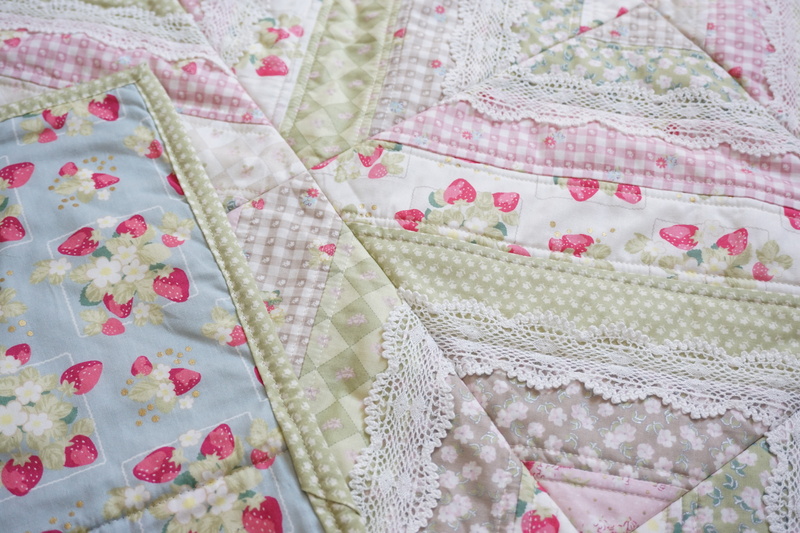 I adore the quilt idea. Well done! 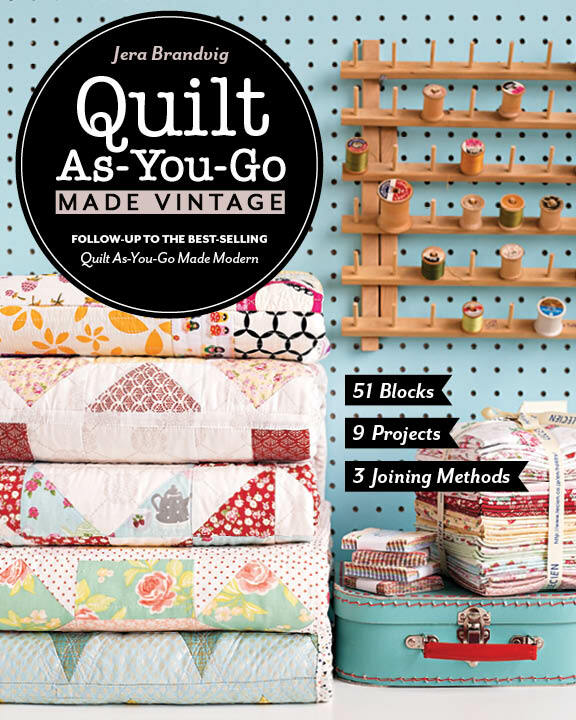 I just got your newest book Quilt as you go Vintage. I may not use this method but I love your quilts. I found it as a great collection of just vintage quilts, regardless of the method. I am from ” across the pond” on Bainbridge Island… !!! I enjoyed just looking at all the patterns !! your boys are adorable . How many of these blocks can you make with an average jelly roll? Lovely Quilt! I loved the touch of lace as a finishing touch. I look forward to trying this method of quilt as you go. This is going to be my very first quilt project – thank you for the inspiration! Will be purchasing your book hopefully tomorrow. I too am wondering about how many blocks you might typically get from a jelly roll. 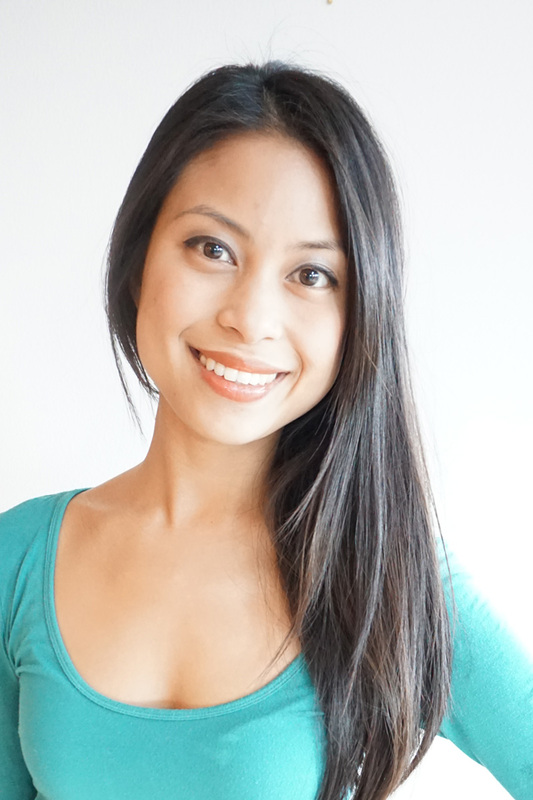 Thank you so much – lovely tutorials. HI Jera! I bought both of your beautiful QAYG books and can’t wait to get started. I don’t see any mention of borders. How are they done in the QAYG method? Thank you for your excellent tutorials and lovely fabric. That you too for answering my questions on borders. I touch on that in Quilt As-You-Go Made Modern, page 31. The triple shot sampler quilt page 96 has borders. What 9 fabrics did you choose from your line? Names please. Great video. I just ordered your book and can’t wait to get started.